This is a colourful and fun new take on a timeless series designed to introduce young children to unfamiliar situations in an amusing and friendly way. 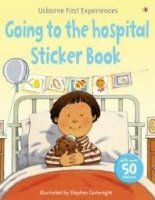 Stickers can be used throughout the stories to replace key words and help young children build their vocabulary. Each title features Stephen Cartwright's delightful illustrations, providing lots to look at and talk about. It is an ideal starting point for young children and adults to discuss first experiences. It contains over 50 stickers and 'I found the duck!' reward stickers.